The American Revolution is one of the most thoroughly documented subjects in American history. Countless books have been published on the topic and there are new ones coming out every year. For readers interested in learning more about the revolution, these books are a great place to start. Since the topic is very broad, the focus of each book tends to vary. Some books cover the entire span of the American Revolution while others focus on particular battles, years, places or people involved. I’ve compiled a list of what I think are some of the best books about the American Revolution. The books mentioned in the list are some of the best-selling books on the topic and all have either a four or five star rating on sites like Amazon, Goodreads and etc. Published in 2013, this book explores the role of Boston and the Battle of Bunker Hill in the American Revolution. In the book, Philbrick argues that the Revolutionary War started in Boston with defiant acts like the Boston Tea Party and the Stamp Act riots, not at the battles of Lexington or Concord, which he considers important yet not pivotal encounters between the redcoats and the militia. Nathaniel Philbrick is an author who has written numerous books about American history including Mayflower: A Story of Courage, Community, and War; In the Heart of the Sea: The Tragedy of the Whaleship Essex; and Sea of Glory: America’s Voyage of Discovery. Published in 2005, this book explores the events of the year 1776 both in the colonies and overseas. The book discusses the actions and events that led Great Britain to engage in war with the colonies as well as the events of the war itself in that particular year. David McCullough is a Pulitzer-Prize winning author who has written many books about American history including John Adams; Truman; The Wright Brothers; The Great Bridge: The Epic Story of the Building of the Brooklyn Bridge. Published in 1994, this book explores Revere’s famous midnight ride and discusses what really happened that night, what led up to that moment and what happened after, revealing that the ride had an important impact on the events that followed. David Hackett Fischer is a Pulitzer-Prize winning author and history professor at Brandeis University where he has been a faculty member for over 50 years. Fisher has written many books about American history including Washington’s Crossing; Champlain’s Dream; and Albion’s Seed: Four British Folkways in America. Published in 1989, this book explores the entire span of the American Revolution by following the major political figures involved in the revolution. Rather than focusing on the chronological events of the war, the book discusses the motives of the people involved and, in doing so, provides a portrait of the mindset of the revolution. A.J. Langguth, who died in 2014, was a journalist, author and journalism professor at the University of Southern California. Langguth served as a war correspondent for the New York Times during the Vietnam war and also wrote numerous books about American history including After Lincoln: How the North Won the Civil War and Lost the Peace; Union 1812: The Americans Who Fought the Second War of Independence; and Our Vietnam: The War 1954-1975. Published in 1982, this book explores the events of the eight-year-long revolutionary war starting with the events that indirectly caused it, such as the French and Indian War, and ending with the election of George Washington as President of the United States. Richard Middlekauff is an author and history professor at U.C. Berkley. Middlekauff has written many books on American history including Ancients and Axioms: Secondary Education in Eighteenth Century New England; The Mathers: Three Generations of Puritan Intellectuals; and Benjamin Franklin and His Enemies. Published in 1971, this book discusses the political and military history of the American Revolution, spanning the entire length of the revolution while doing so. Rather than provide a blow-by-blow of the battles of the revolution, this book instead discusses the military people, events, and issues of the revolution. Don Higginbotham, who died in 2008, was an author and history professor at the University of North Carolina. Higgingbotham specialized in 18th century American history and was a leading scholar on George Washington. Higginbotham wrote many books about American history including George Washington and the American Military Tradition; George Washington: A Uniting Nation, Revolution in America: Considerations and Comparisons; and War and Society in Revolutionary America: The Wider Dimensions of Conflict. Published in 1997, this book covers the entire span of the American Revolution and also discusses the issues and events that led up to the war, such as how debt incurred from the French and Indian War prompted the British government to heavily tax the colonies which then spurred the colonists to rebel. Benson Bobrick is an author who has written many history books including Fight for Freedom: The American Revolutionary War; East of the Sun: The Epic Conquest and Tragic History of Siberia; and Testament: A Soldier’s Story of the Civil War. Published in 1969, this book covers the span of the American Revolution from the days of the French and Indian War to Washington’s inauguration and, while doing so, details the important political, military and social aspects of the revolution. The book is noted for being a balanced, fair portrayal of the revolution. It doesn’t glorify the patriots or the founding fathers and instead provides an accurate depiction of both sides involved in the war. John R. Alden, who died in 1991, was an author and history professor at Duke University. Alden wrote numerous books about the American Revolution including The South in the Revolution, 1763-1789, George Washington: a Biography; General Gage in America: Being a Principal History of His Role in the American Revolution; and Rise of the American Republic. Published in 1962, this book also explores the events of the Battle of Bunker Hill which took place during the Siege of Boston. The book discusses the events of the battle as they happened, using first-hand accounts to bring them to life, and also describes the various factors that influenced the battle and its outcome. Although the book was published several decades ago, it is still considered one of the best books about this famous battle. Richard M. Ketchum, who passed away in 2012, was an author and magazine editor who wrote a number of books about the American Revolution including Saratoga; Turning Point of America’s Revolutionary War; Divided Loyalties: How the American Revolution Came to New York; Victory at Yorktown: The Campaign that Won the Revolution; Winter Soldiers: The Battles for Trenton and Princeton. Published in 1991, this book discusses the transformation American society went through as a result of the American Revolution. The book explores how the colonies went from being a “deferential, monarchial, ordered, and static society” to a liberal, democratic society virtually overnight. The book won the Pulitzer Prize in 1993. Gordon S. Wood is an author and a history professor at Brown University. He has written many books about the American Revolution including The Creation of the American Republic: 1776-1787; The American Revolution: a History; and Empire of Liberty: a History of the Early Republic, 1789-1815. 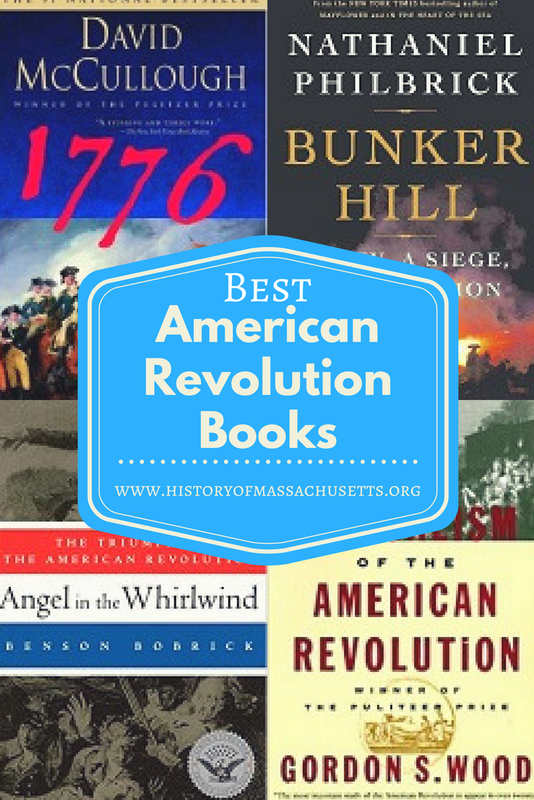 Although I tried to include as many books as I could in this list, keep in mind that there are so many great books about the American Revolution that this list is just a small sample of the great works available on the subject. If you are interested in learning more about American history, check out the following article about the Best Books About American History.